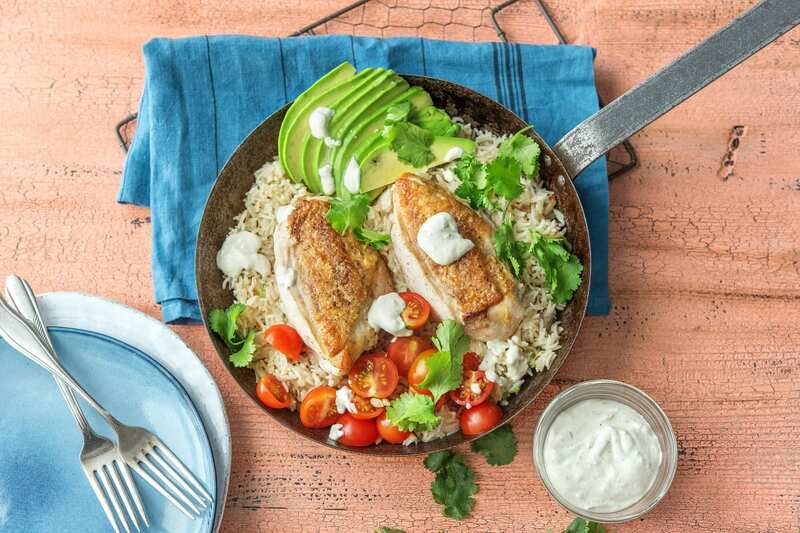 This simple chicken and rice dish is flavoured with bold spices like cumin seeds and our fantastic Mexican Fajita spice blend. Toasting the rice in a bit of the chicken fat adds big taste too. The dish is finished with our take on deconstructed guacamole - all the flavours of guacamole with no mashing required! Preheat your oven to 200 degrees. Cut the onion in half through the root. Peel and then chop into small cubes. Heat a drizzle of oil in a wide bottomed saucepan over medium-high heat. Season the chicken on both sides with salt and black pepper. Add your chicken to the pan, skin-side down and cook for 4-5 mins, until the skin is golden and crispy. Transfer to a baking tray skin-side up and roast on the top shelf of your oven for 18-20 mins. Don't wash your pan we will use it for the rice. Tip:The chicken is cooked when it is no longer pink in the middle. Once it's cooked, pop it on a chopping board to rest for 5 mins. 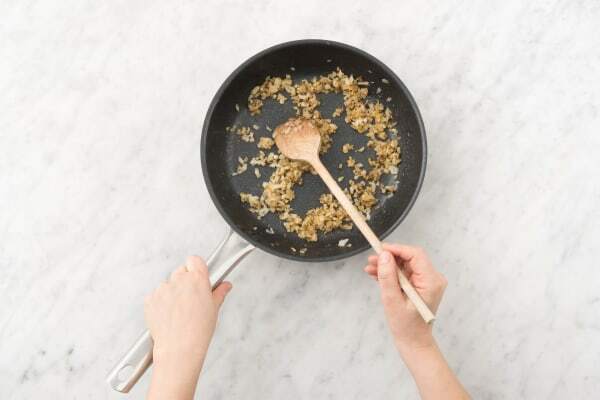 Add another drizzle of oil to the pan (if necessary) and lower the heat to medium. Add your onion, cumin seeds, and two-thirds of the Mexican Fajita spice blend (use less if you don't like spice). Cook for 3-4 mins or until your onion is soft. Add the rice to the pan and stir to coat in the fragrant oil for 1 minute. Season with salt and black pepper. Pour in the water (amount specified in the ingredient list) and bring to the boil. Cover with a lid, reduce the heat to medium-low and cook for 10 mins. After 10 mins, remove from the heat and leave the rice to cook in its own steam for another 10 mins. Halve the plum tomatoes. Pick the coriander leaves off their stalks and finely chop your stalks. Keep your coriander leaves whole. Zest and squeeze the lime. Cut the avocado in half, remove the stone by stabbing with a knife and twisting. Scoop out the flesh with a large spoon and slice thinly. Next, make the zesty sour cream. Stir together the sour cream, a pinch of lime zest, a dash of lime juice, a splash of water, and a pinch of Mexican Fajita spice in a small bowl (use less if you don't like spice). Taste and add more Mexican Fajita spice, salt, black pepper and lime (zest or juice) until you're happy with the flavour. 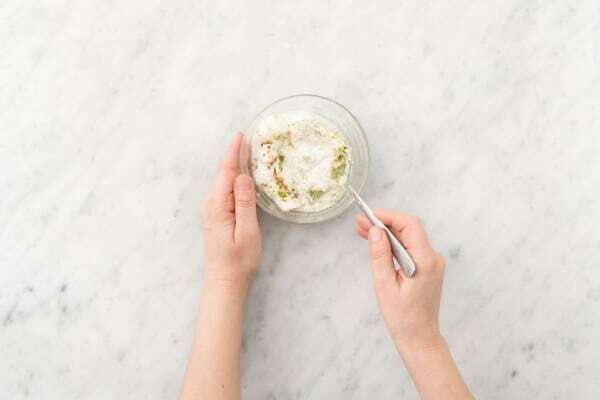 Fluff up your rice with a fork and stir in any leftover lime juice, lime zest, the coriander stalks and any chicken juices from the baking tray. Add more salt and black pepper if required. Place your chicken on top of your rice in the pan. 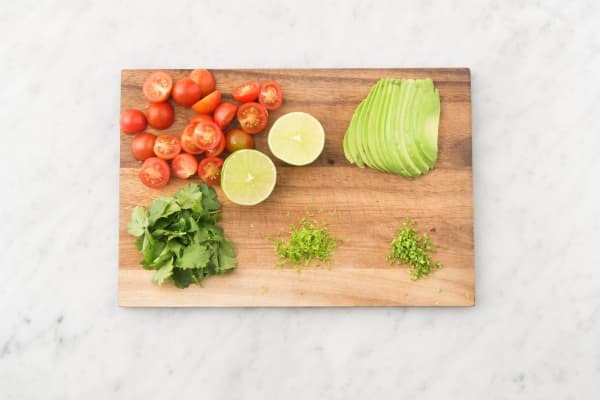 Arrange the tomatoes and avocado slices on top. Drizzle with as much zesty sour cream as you like and sprinkle with coriander leaves. Serve straight out of the pan. Enjoy!